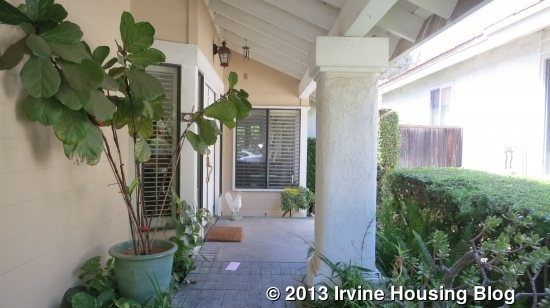 The location of this home, at the end of the cul-de-sac and just a half block to the elementary school and Clubhouse, is great for any family. 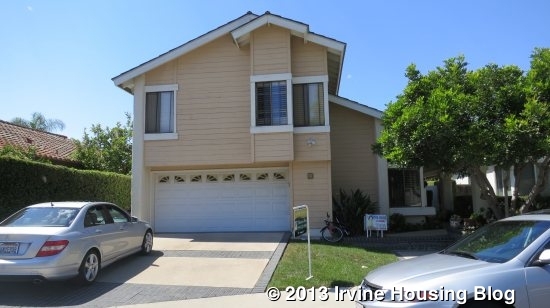 Three bedrooms, two bathrooms and a large bonus room are located on the second level, while one bedroom and one bathroom are located on the first floor. Upon entering, there is space for a small table which sits along the side of staircase. To your left are a small full bathroom and a bedroom. 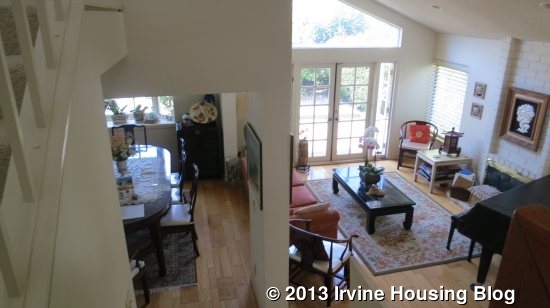 To your right is the living room and dining room. 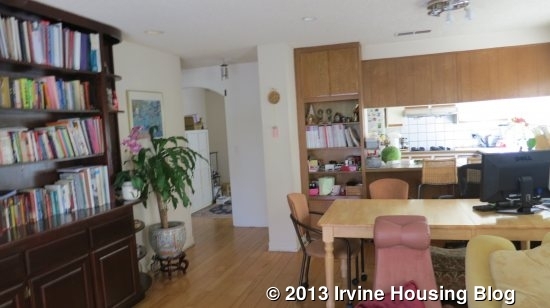 Behind the dining room wall is the family room and kitchen. View of Entrance. Living Room is to the left in this picture. 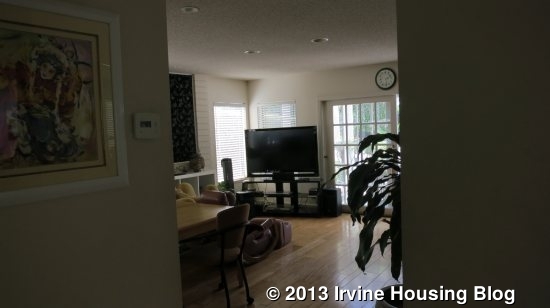 This home, unlike some of the other models with the same layout, has a fireplace in the living room (in addition to the family room). 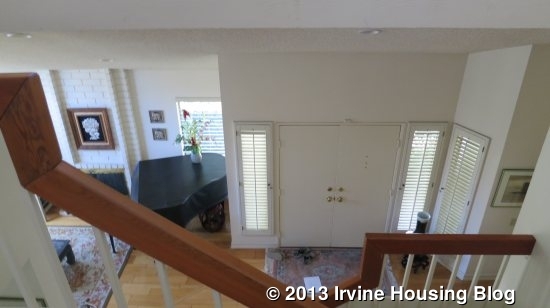 The living room has a sunken floor and French doors leading to the back yard. Downstairs Bedroom and adjacent bathroom. 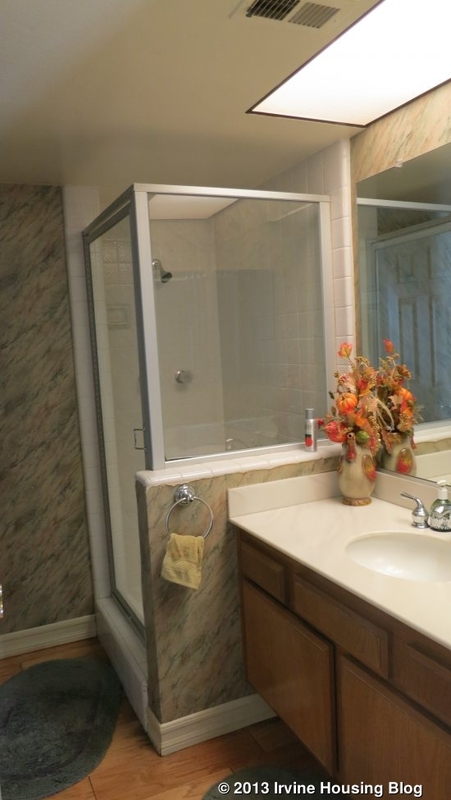 The bathroom has original cabinets and lighting, but is clean and the shower looks newer. Although the ceilings have the original popcorn texture, the vaulted height and large windows creates a light and open feel. Apart from the carpeted bedroom, the floors downstairs are hard wood. The sliding glass door and window facing the back are new, while the rest of the house has original windows. 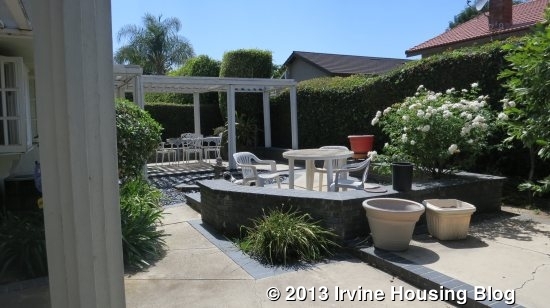 The backyard has no grass but has a lattice patio cover on entry outside of the family room. There is also a sliding glass door for entry to the back yard from the family room. 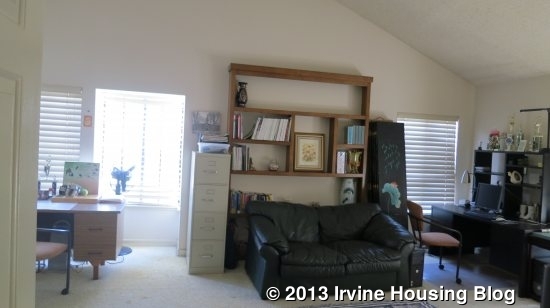 The family room has built-in shelves that span the entire wall. View from Sliding Glass door looking into Family Room/Kitchen. Built-ins are along the left. 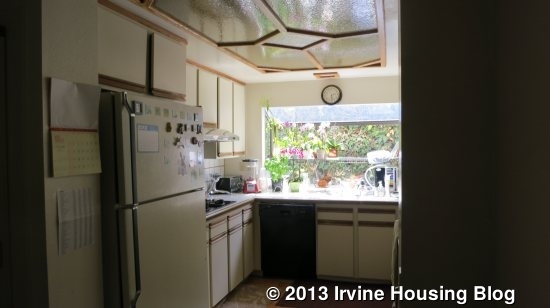 The kitchen has fluorescent lighting in the ceiling and original cabinets. 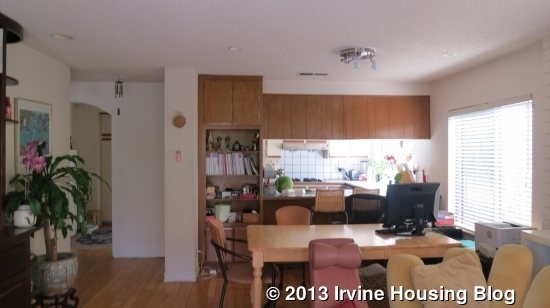 On the right is the oven and an open wall with overhead cabinets and counter for a couple of bar stools. Garage entry is off of the kitchen. Laundry hook up is found in the garage. 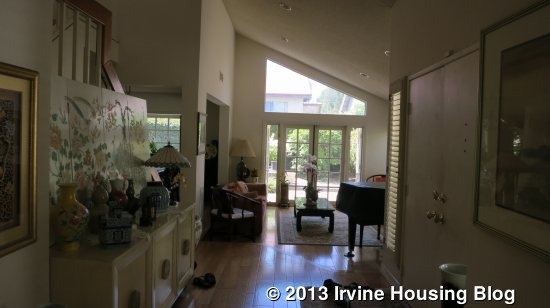 Upstairs has vaulted ceilings as well. 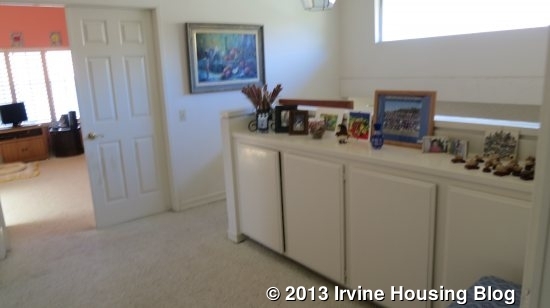 The small landing comes with built-in cabinets running along the side of the staircase. Note that the staircase has the original ballusters. 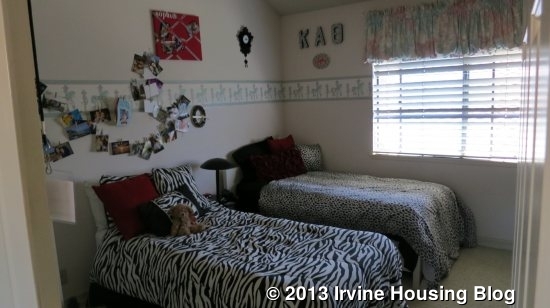 All bedrooms and the staircase have carpet, which may need to be cleaned or changed. 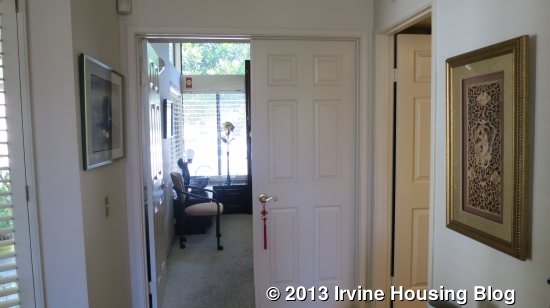 Immediately to the right are double doors leading into the Master Bedroom. The windows face the back yard. 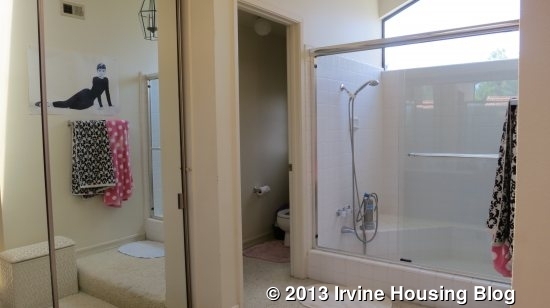 The bathroom is large with an open solution, not having a door separating it from the bedroom. 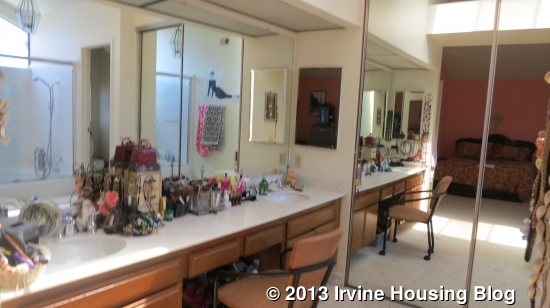 Master Bedroom and entrance to bathroom sink/vanity area. 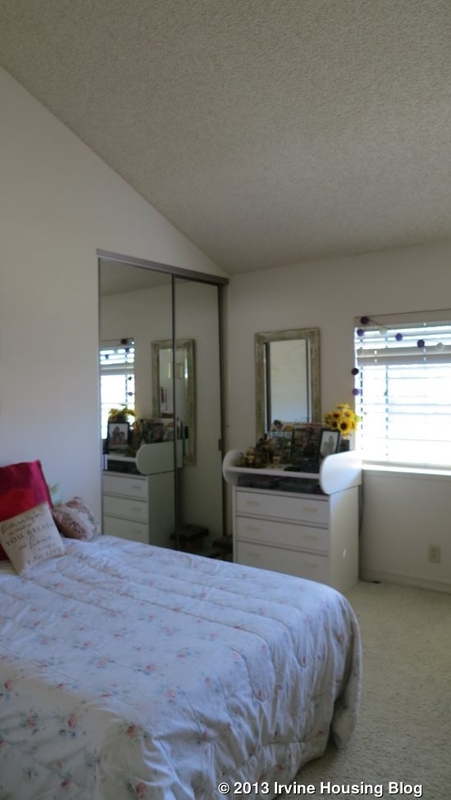 Large mirrored closet. 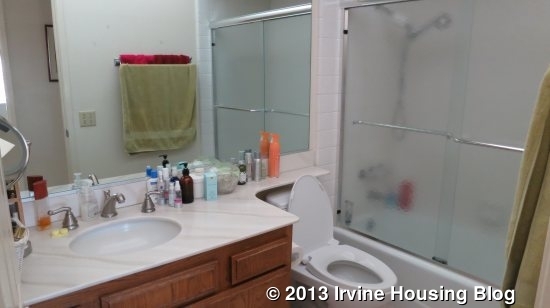 More closets in vanity/sink area of bathroom. Sunken bathtub/shower. Toilet located in own private area. View coming up stairs into first bedroom. 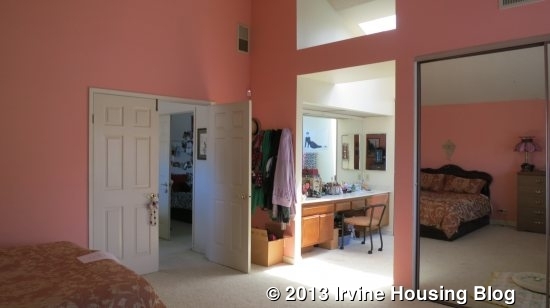 First bedroom upstairs has a double door entry and appears slightly larger than the other upstairs bedroom. 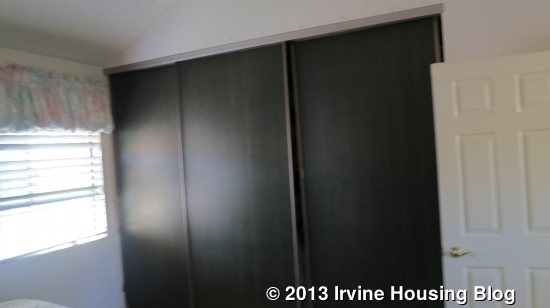 The larger bedroom also has more closet space with an extra third sliding door. Adjacent to the hallway bathroom and at the opposite end of the hall from Master Bedroom is a large Bonus room which faces the front of the house. It sits above the entire garage. View walking out of Master Bedroom. 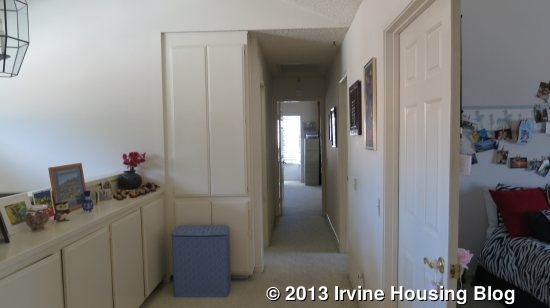 Opposite end of hallway is the Bonus Room. The house could use upgrades to modernize it. However, someone has the opportunity to add their own personal touches and choose how they want to re-model their own house. 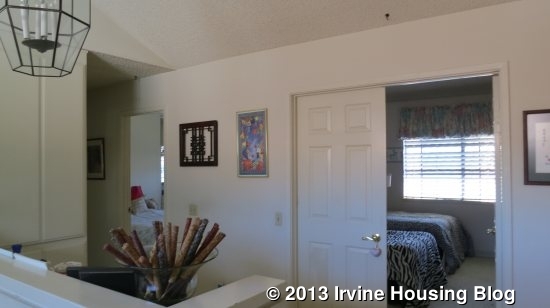 Someone looking for a bedroom downstairs would like this model, especially considering the fact the house has the extra large bonus room upstairs that they can use as a guest room/office/playroom. The low HOA fee includes Park Paseo’s two tennis courts, walking distance to a large pool, baby pool and large Jacuzzi as well as access to the Clubhouse. 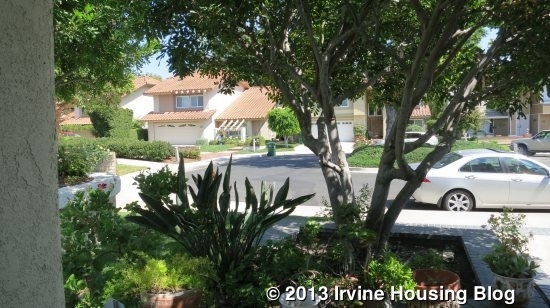 This entry was posted in Real Estate Analysis on August 26, 2013 by Joy.